XVIIIth century travellers had the choice of three roads to reach Rome: very few travelled along Via Aurelia: it was unhealthy and there were no interesting sites to see. Via Cassia was chosen by those who wanted to visit Siena, but brigands overran a stretch of the road near Acquapendente; the safest (but not the shortest) route between Florence and Rome was via Perugia, Assisi and Foligno. From this town travellers reached Rome along Via Flaminia. While we were alighting out of our Chaises to dine, at the Post House opposite to Castel nuovo, I observed the following Inscription, which is set into a Marble chased in the Wall, importing that the Inhabitants of this Place had, under Pope Gregory XIII, cleared and opened the Flaminian Road. This page deals with the small towns near the last stretch of Via Flaminia between Civita Castellana and the outskirts of Rome (Malborghetto). Most XVIIIth century travellers found the last leg of Via Flaminia very boring and desolate. J. W. Goethe to the contrary was impressed by the landscape he saw: "It is only the water tearing across the volcanic areas which has carved them into extremely picturesque shapes, overhanging cliffs and other accidental features." (Italian Journey - October 28, 1786). Grand Tour travellers were not the only users of Via Flaminia; during the Succession Wars (1701-48) several armies followed this road to reach the Kingdom of Naples: in 1734, at the age of 18, Don Carlos, Duke of Parma, commander of a small army, led his troops along this route on their way to conquer that kingdom: he spent a night at Castelnuovo di Porto and the event was celebrated by a lengthy inscription. In 1787 this stretch of Via Flaminia lost importance because Pope Pius VI opened a new road between Civita Castellana and Monterosi (which is located along Via Cassia) and most travellers preferred to reach Rome by the new road. 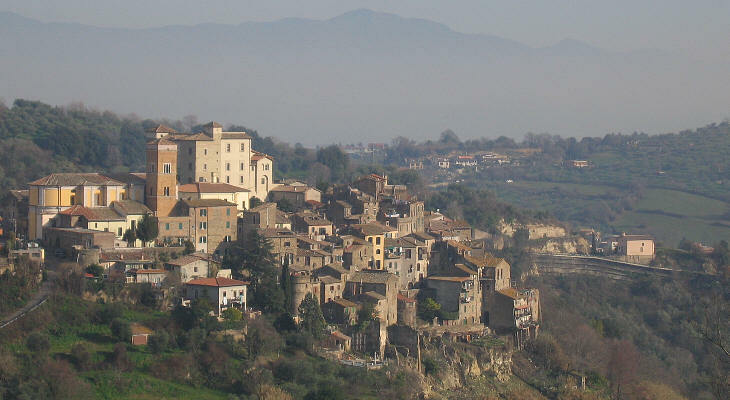 Riano is located on a small isolated tufa rock which has been fortified since the time of the ancient Romans. The medieval castle at its western end was turned into a palace by the Cesi, who acquired Riano in 1571. For many centuries Riano, similarly to Civitella S. Paolo and Leprignano, had belonged to Monastero di S. Paolo. In 1710 the Cesi sold Riano to the Ruspoli who later on sold it to the Boncompagni Ludovisi: the owners of Riano are remembered by many coats of arms and by the names of the streets. In 1713 Prince Francesco Maria Ruspoli placed his coat of arms on the only gate of Riano: it is associated with that of the Cesi (the previous owners): the two can be seen also in nearby Vignanello. In 1730 he built at the foot of the tufa rock a fountain which bears just his coat of arms: you can see it in the image used as background for this page. The reference to Porto in the name of Castelnuovo is most likely due to the town being included in the diocese of Porto, which was held by a senior Cardinal. Castelnuovo was for many centuries a fiefdom of the Colonna, one of the few this powerful family had north of Rome. Towards the end of the XVIth century the Colonna had significant financial difficulties (more on this following this link) and Castelnuovo became a direct possession of Camera Apostolica, the body of the Papal State in charge of the fiscal system. This explains why in 1624 a coat of arms of Pope Urban VIII was placed on one of the side walls of the castle. The Cardinals of Porto were keen on providing the inhabitants of Porto with well kept churches. Move to Morlupo and Leprignano or to Lucus Feroniae or to Villa dei Volusii.